This is a game of invasions and survival. Each player (usually four) controls 4 or 5 nations, each nation has different objectives. The player whose nations score the most points by the end of 16 Rounds wins. The rules are long, but the game is easy to play in practice, nearly as easy as Risk, easier than Axis and Allies. The game covers the period from the Roman invasion to the Norman invasion, over 1,000 years. Objective: Score points, mostly from holding territory, as shown on Nation Cards. Most points for your nations at the end of the game wins. With a few exceptions, nations all score at the end of Rounds 5, 7, 10, 13 and 16. Point markers are provided, though many players use downloadable scoresheets. Sequence: Each nation (not player) plays in turn. 1) Get population increase and scheduled reinforcements (shown on the board); 2) move units; 3) fight. When all nations have played the Round is over. Increase of Population: Count 2 for each clear terrain area, 1 for difficult; 6 points earns a new army, any remainder is saved via a Population Track. Movement: Two areas, three if cavalry, or Romans, or with a leader; opponent stops movement unless you outnumber defenders 2-1 (“overrun”); those not needed to overrun can continue move. Difficult terrain halts movement unless a leader is moving along with the armies. No more than two of your armies can be in a difficult terrain area, or three in non-difficult (clear), except you are allowed one “overstack”, which can be up to four in difficult, unlimited in clear. Combat: When jointly occupying an area after movement is done, both sides simultaneously roll 6 sided dice, one per army, eliminating an opponent with a roll of 5 or 6. Cavalry and Romans need 4, 5, or 6 to hit in clear terrain. A 6 is needed to kill defenders in difficult terrain, cavalry, or Romans. After all armies in an area have fought once, the defender, then attacker, can retreat one or more armies. Fight until only one side remains in the area. Leaders: allow movement through difficult terrain; up to three areas; and add one to combat dice rolls. A given leader is in the game only one Round, except at the end of the game (the “Four Kings”). Invaders: usually come over the sea, sometimes have Major Invasion (Increase, move, fight, move, fight). Overpopulation: At the end of your turn you cannot have more than twice as many armies as the number of areas you occupy. The Romans are exceptions to many rules: they have “roads” that aid movement, they build forts (that can be burned down by attackers), they can have large stacks everywhere and overpopulation, and they leave at the end of Round 5 and are succeeded by Romano-British. Some nations can submit to Romans in order to survive. The game goes through different eras: Roman conquest, the triumph of the English, the Vikings, and the “Four Kings”. Different nations and colors are most dominant in each era. It is not a conquest game in Risk style; you can play it that way, but you probably won’t win. The strategy is deep, every move, every location, matters. No one is going to recognize most of the ramifications until they have played several times. I know people who have played five hundred times (counting original Brit), yet still enjoy the strategy. Britannia is an epic game, 4-5 hours for experienced players. There is a 3 player short version, shorter 2 player versions (for practice), and short scenarios will be freely available. 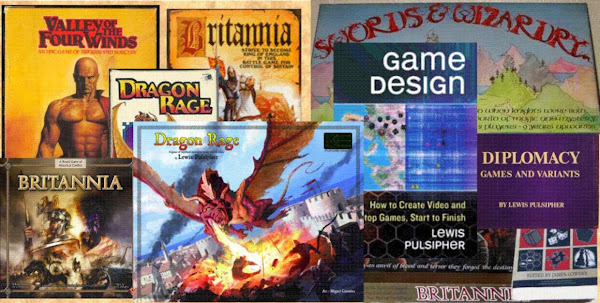 See the Historical Walkthru on pulsiphergames.com or fantasyflightgames.com (nicer graphics) for an extended example of play with maps. Videos and podcasts with more details of how to play are planned. This Quick Guide is NOT part of the Britannia rules, and does not supercede/overrule those rules in any way. There is no way to include, in one page, the details necessary for a full set of rules.